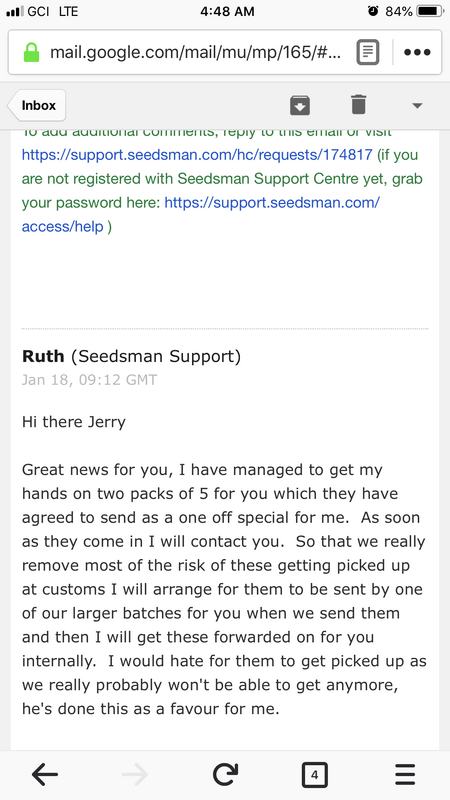 So seedsman is going above and beyond. Ruth understands Barney’s farm has grinspoon seeds but are only selling them retail on their site so their purchasing department couldn’t get any. However I just got word from her stating she is going to ask them to sell her a 10 pack as a one off then get them to me. Fingers crossed they allow her to do so!!! Talk about customer service!!! I sure hope Barney’s lets Ruth from seedsman buy that 10 pack for me. I have dreamed of growing her for years! have dreamed of growing her for years! I spent some time searching. 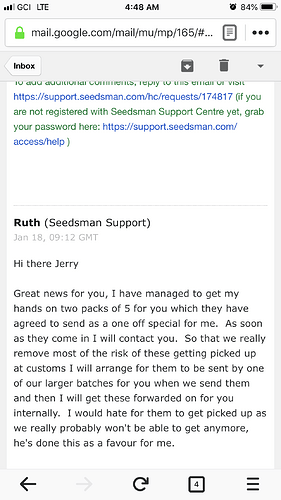 It seems that strain is available from seedbanks in Europe but they don’t ship to North America and the seedbanks in NA don’t seem to get supply or not very often. Interestingly enough you can pretty much find any of their other strains. Yep, those other banks may have had them, but most don’t and those that do have a very limited amount. Barney’s pretty much always had a supply, but the strain is being discontinued, not sure if for good. Interesting, doesn’t look like a high yielder but if the quality makes up for it I guess it would be ok. Need a mother plant if they are going to discontinue and clone for ever more. The smoke is an absolute game changer. It grows into little compact “pearls” with many on the plant. Not sure about cloning this girl. Will need more expert advice on that, but I do plan on seeding one plant so as to ensure the strain doesn’t die. Not sure about cloning this girl. Im not an expert on mothers for clones but I’d imagine a regular seed (not feminized) and if the clone always come from the mother you won’t get generational degrading. What say you @Stephen ? If you get a solid female in your seeds, then by all means keep her in a mother chamber and clone away. You will be good for years. Combining a male with your female to produce seeds will start to see some drift and complexity come into your gene pool. Tenacity and perseverance pay off. I’ll wait for seeds in hand before I celebrate, but talk about customer service…wow I’m impressed. "Dr. Grinspoon by TOTEM" cannabis grow journal. Strains: Barney's Farm Dr. Grinspoon by TOTEM. Grow room Indoor, growing in Soil. Harvest yield, seeds review, grow details.